Boating regulations are there for your safety, and it is your responsibility to know them. Just as the driver of an automobile is responsible for his own safety, the safety of his passengers and the safety of others, so too must the operator of a boat be concerned about safety. Boating can be inherently dangerous, but it should not be any more so than driving a vehicle on land. However, unlike driving an automobile where one must first secure a "Learner's Permit," pass a written test, a driving test, and is then issued a Driver's License, a few states, including Arizona and Utah, have no such requirements for the recreational or occasional boater. Utah does, however, require children, ages 12-17, to have completed a boating education course before operating a personal watercraft (PWC). Photo: Courtesy of "Boat Owners Association of The United States"
Without so much as a certificate of any kind, without any training, without any knowledge of boating safety and the rules and regulations governing the use of a boat on public waters and without even donning a life jacket, you can hop in a boat and go. But, whether you know the boating regulations or not, you are accountable for the safe and responsible operation of your boat. Ignorance of the law is no excuse, and it is up to you to practice boating safety. - you are in a designated, wakeless speed area. - you are in a launch or ramp area. - you are in a designated swimming area. - you are within 150 feet of another boat, a person in the water or a person fishing on the shore. 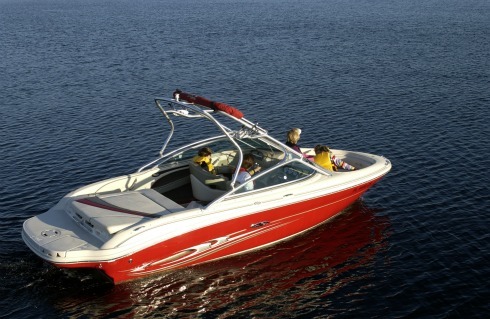 •	You must be at least 16 years of age to operate a motorboat without restrictions. •	If you are under 16, you may operate a motorboat if there is a responsible person on board who is at least 18 years old. •	You may only tow someone behind your boat between the hours of sunrise and sunset. •	The person being towed must wear USCG approved personal flotation device. 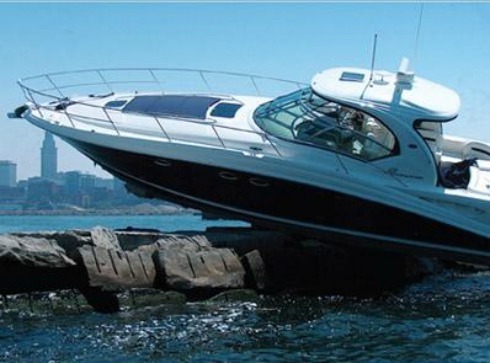 •	You may not tow a person in a non-standing position within 20 feet of the stern of the boat. Photo of Dog: "Boat Owners Association of The United States"
•	You must have an observer aboard your boat who is at least 8 years old. Having a rear view or side view mirror does not exempt you from this rule. •	The observer must display an international orange flag, which must be at least 12 inches square and be affixed to a handle, whenever the person being towed is in the water e.g. when he/she is waiting to be towed or after being towed. •	You are prohibited from idling the motor when there is someone on, or holding onto, the swim platform, swim deck, swim step or swim ladder. In other words, turn off the motor when someone is in the water at the stern of the boat! •	You must be at least 18 years of age to operate a PWC without restrictions. •	If you are under 12 years of age you may not operate a PWC. •	If you are between 12 and 17 years of age, you must complete an approved boating education course and have in your possession a certificate of completion. •	If you are between 12 and 15 years of age, in addition to the education requirement, you must be under the direct supervision* of a person who is at least 18 years of age. 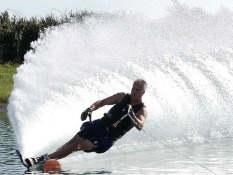 *Direct supervision means being in direct line of sight with the boat operator. The Rules of the Road define the roles and responsibilities of vessel operators. If all operators obeyed these rules, most accidents could be avoided. One of the reasons the Rules of the Road exist is to keep boats from colliding with each other and with other objects. •	Post a lookout. Designate someone to watch for dangers that may come from any direction. •	Maintain a safe speed. Except where speed is restricted by regulation or the waterway is marked by a “No Wake” or “Slow Speed” Aid, you must judge “safe speed” for yourself, taking into account visibility, vessel traffic, your boat’s ability to maneuver, and the weather conditions. 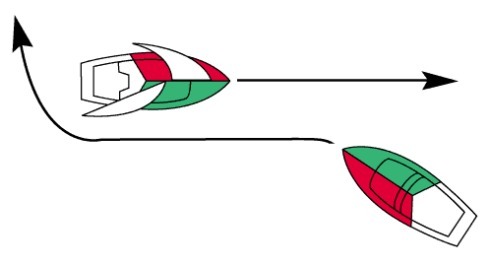 A boat that is overtaking another must steer clear of the overtaken vessel's path. A vessel approaching from the port side must give way. (A) keeps clear of and must avoid crossing ahead of (B). When two vessels are heading toward each other, each must reroute and pass to the right of the other. 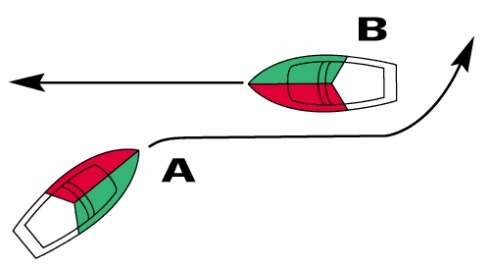 (A) blows one blast and alters course to starboard, (B) blows one blast and alters course to starboard. As a general rule, rowboats, sailing vessels and canoes have the right-of-way over power-driven boats. However, if one vessel is unable to maneuver as it normally would, the most maneuverable vessel gives way. •	On rivers, boats going downstream usually have the right of way over boats going upstream. •	In narrow channels, boats underway must stay as far to the right of the middle of the channel as is safely navigable. - Motorboats must slow to a wakeless speed if they cannot stay at least 150 feet from other boats in the channel. •	Check out your boat! •	Make sure your boat is in good working order before taking it out for the first time. •	Check your safety equipment! - Make sure all required equipment is put on the boat and is in good working order. •	Check your life jackets! working order. 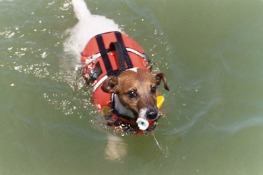 All straps, buckles and zippers need to be operational, and the life jackets cannot have any rips or tears. •	Take a boating class! •	Learn Courtesy on the Water! - From the time you start to tow the boat to the launching ramp until the time you take it out at night, courtesy plays a big part in the boating adventure. - Remember the golden rule and treat others the way you would want to be treated. •	Be careful of your wake, both around fishermen and around other boaters. •	Keep A Weather Eye Out! - Storms can come up quickly, especially in the summertime, so keep an eye to the sky. 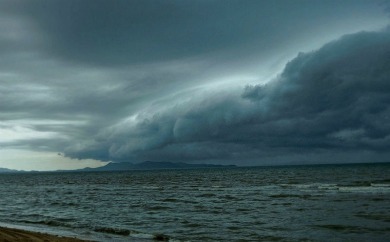 Watch for temperature changes, shifts in wind patterns and changes in cloud formations. All these can signal storms moving in. - Be aware of what other boaters are doing around you. Even if you have the right-of -way, if the other boater doesn't give way to your vessel, you give way! •	Don't Drink and Drive A Boat! 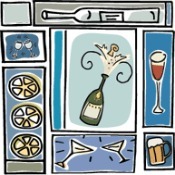 - Just like on the highway, drinking and operating a ﻿boat is against the law. In many ways, it can be even more dangerous. Association of The United States"
Boaters tend to get a condition called boater's fatigue, caused by the glare of the sun, action of the waves and general tiredness, towards the end of the day. Adding alcohol to this can create a deadly combination! There is much more to boating regulations than can be covered here.